NECA 2013 Washington DC, the electrical industry’s largest convention and trade show, will include displays from 300 exhibitors, insightful speakers and 19 free technical workshops on the Show floor, Oct. 12-15 at Walter E. Washington Convention Center. However, the educational opportunities start before the opening festivities on Saturday, Oct. 12. Special pre-convention workshops starting Friday, Oct. 11 through Saturday, Oct. 12 offer an in-depth look at the trends and technology shaping the electrical construction industry. Each workshop is led by the leading experts in the areas covered, and training materials will be provided with course registration. Continuing education units (CEUs) can be earned for each pre-convention workshop. Pre-convention workshops are generally run longer than convention management seminars and technical workshops. Price varies based on the program. Check the full listing on www.necaconvention.org for prices, dates and times. Instructions for adding a pre-convention workshop to your current registration can be found on blog.necaconvention.org. Popular programs this year include in-depth forums, can-do technology demonstrations, and safety training. 2013 NECA Energy Forum – As our nation strives for energy independence and consumer demand for renewable power and energy conservation continues to rise, electrical contractors are constantly updating their expertise in green energy trends and technology. The NECA 2013 Energy Forum will bring electrical contractors together with leading policy-makers and industry leaders shaping the energy solutions market today. The speakers and panel discussions at the 2013 NECA Energy Forum are the best source for practical information about the trends, technology, and economic factors affecting the energy market today. Discover the latest advances in emerging technologies, energy efficiency, renewables, energy storage, combined heat and power, and the projected abundance of natural gas can mean for the electrical construction industry. The Energy Forum will wrap up just in time for the finalists’ presentations for NECA Green Energy Challenge, the annual NECA Student Chapter design competition. Safety Forum – When it comes to electrical construction, safety is everyone’s job. However, it takes a real leader to make safety a company priority. If you manage a workplace or jobsite safety program, enforce or develop safety standards, supervise workers, oversee a facility, or simply strive for a safe work environment, you need to attend the second annual Safety Forum at NECA 2013 Washington DC. The Safety Forum goes beyond the basics. It is your opportunity to network with your industry peers, share best practices, and hear directly from the leaders developing and enforcing U.S. safety practices. Saturday, Oct. 12, 8 a.m.-4 p.m.– Sunday, Oct. 13, 8-10 .m. The Crazy World of LEDs and Controlling Them – Light Emitting Diodes are the current darling of lighting efficiency experts, but LED lighting controls can get complicated. This two-hour workshop explains troubleshooting dimmers, wireless controls and sensors, as well as their integration into larger systems. Lighting expert Jim Benya will demonstrate some of the latest products from manufacturers and how to keep up with LED innovations that seem to move at the speed of light. Leveraging BIM to Drive Scalable Prefabrication – Two industry buzzwords for productivity, “Building Information Modeling” and “prefabrication” will join forces in a two-hour course on how BIM can be integrated into an electrical contractor’s prefabrication operation. See how BIM allows contractors to use a virtual 3-D prototype of the project and map options for prefabricated components, then work with supplier to increase job site efficiency. Friday, Oct. 11, 1-3 p.m.
OSHA Train-the-Trainer 10-Hour Course – Registrants must have current OSHA 500 or 501 certification to participate in this course on becoming an OSHA 10 Hour trainer. The OSHA 10 Hour is the foundation of safety training for the high-voltage line industry, and the growth in line work nationwide means more trainers are needed to help get all workers safety-ready. This course is offered in cooperation with the OSHA ET&D Partnership. Friday, Oct. 11, 8 a.m.-5 p.m.– Saturday, Oct. 12, 8 a.m.- 5 p.m.
2014 National Electrical Code Significant Changes – NECA is an active participant in the NEC development process with representation on each of the 19 National Electrical Code (NEC) technical committees. This four-hour course is an extensive overview of significant changes to the National Electrical Code for the 2014 cycle. Learn what is new and revised, and how these changes may impact your business. Stay ahead of the game by catching a glimpse of some interesting and important NEC revisions in the next edition. Friday, Oct. 11, 1-5 p.m.
Additional pre-conference workshops are posted online. Instructions for registering adding a pre-convention workshop are posted on the NECA 2013 DC blog, blog.necaconvention.org. Want to make the most of your time in Las Vegas? Want to learn about the hottest topics in energy efficiency and business development? Make plans to be at the Energy Forum on Saturday, September 29 starting at 1:00 pm. And, best of all, if you have a full convention registration, access to the Energy Forum is included! Electrical contractors offer the solutions for all the emerging technologies affecting building performance, operating costs and occupant productivity. The 2012 NECA Energy Forum will explore the many ways NECA contractors are growing their businesses by expanding into the energy solutions market. The Forum, hosted this year by NECA Vice Presidents Stan Lazarian (District 9) and Dan Schaeffer (District 7), opens at 1 p.m. with keynote speaker David L. Pogue, Global Director of Sustainability for CB Richard Ellis, Inc., speaking on the sustainable energy practices that can make a real difference in the costs of property management and how electrical contractors can connect with owners and managers. Following the opening keynote, Rob Colgan, NECA Executive Director of Market Development will moderate a panel discussion on “Opportunities in the Energy Solutions Market: Technology and Policy Shaping Tomorrow.” Leaders from across the business community will provide insight and perspective on the energy solutions market. Representatives from wholesale merchandising, electric vehicle manufacturing, and the academic community will share their knowledge about specific electrical contracting opportunities in their business sectors. A second expert panel on “Developing New Business for Electrical Contractors” will complete the plenary content for the Energy Forum. NECA contractors from across the country will discuss the different ways their companies implemented business development programs to pursue and get energy solutions work. No two methods are exactly the same; each strategy reflects the unique strengths and goals of these individual NECA contractors. NECA Director of Market Development Mir Mustafa will moderate the panel and field questions from participants. The business development panel will appeal to contractors with established business development strategies who want to expand, as well as to contractors who want to get started. “Energy solutions work and business development go hand-in-hand. You can’t be successful in one without the other,” said Stan Lazarian, chair of NECA’s Energy Solutions Task Force. ABOUT THE 2012 NECA ENERGY FORUM: The 2012 NECA Energy Forum is an intensive Saturday afternoon program featuring an outstanding keynote speaker and expert panels that will inform and inspire NECA contractors to grow their businesses through energy solutions. The Forum will conclude just in time for the Green Energy Challenge finalists’ presentation, the annual NECA Student Chapter design competition where some of the brightest young minds from across the country present their energy solutions to the NECA audience and judges. Your energy solutions education at NECA 2012 Las Vegas doesn’t have to stop with the Energy Forum. A series of related management workshops and technical workshops are offered throughout the Convention and the NECA Show. The NECA Energy Forum was launched in 2011 to deliver industry-specific information about the market opportunities and business process of energy solutions work to electrical contractors. The NECA Energy Forum has become an integral part of the NECA convention and tradeshow experience and will continue to address topics like building automation and controls; energy efficiency; electric vehicle charging; energy storage; lighting retrofits; smart grid technology; solar/PV; and wind generation. The 2012 Energy Forum is available for individual registration or is included with your with full convention registration for NECA 2012 Las Vegas, and will be held Saturday, Sept. 29, 1:00 – 4:15 p.m., at the Mandalay Bay Convention Center in Las Vegas. The 2012 NECA Energy Forum will focus on the business realities of the energy solutions market, and the Forum’s keynote speaker David L. Pogue certainly knows the economic benefits of using green energy technologies. As Global Director of Sustainability, Institutional & Corporate Services for CB Richard Ellis, Inc., the world’s largest commercial real estate services firm with 300 offices worldwide, Dave Pogue is responsible for leading sustainability programs for CBRE’s property and facilities management portfolio across the Americas. Prior to joining CBRE, Pogue served as Executive Vice President, Ownership Services, for Insignia/ESG in the Western Region and joined CBRE with the company’s acquisition of Insignia. Before joining Insignia, he was Director of Management Services for CB Commercial in the San Francisco Bay Area. At CBRE, his leadership has produced an award-winning sustainability platform that leverages thought leadership, outstanding service delivery and corporate associations to raise the worldwide green building standard. Program achievements include aggressive endorsement of the U.S. EPA ENERGY STAR® program, the introduction of the Green Knights, delivery of co-branded BOMA BEEP training to nearly 10,000 attendees and recognition as the first manager of commercial property to certify more than 100 buildings in the LEED® for Existing Buildings rating system. CBRE was also ranked No. 30 in Newsweek’s list of the 500 greenest companies in the U.S., honored by the EPA as a four-time ENERGY STAR Partner of the Year and recognized by the U.S. Green Building Council® with the Leadership Award for Organizational Excellence. 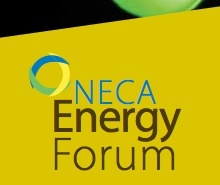 NECA Energy Forum Returns in 2012 by Popular Demand! A revolution in energy technology is sweeping the nation, and each new discovery or innovation means growth opportunities for electrical contractors. Powerful advances in energy efficiency and renewable energy sources are creating new, profitable markets for those NECA members that recognize the signals and seize the moment. In 2011, the first-ever NECA Energy Forum in San Diego drew over 250 contractors and their employees to a full-day combination of plenary sessions and breakout workshops detailing the numerous possibilities in renewable power technology and integrated, energy-efficient building systems. This year, the 2nd Annual Energy Forum is an intensive afternoon program on Saturday, Sept. 29 featuring keynote speakers and expert panels focused on the growth opportunities in energy solutions for electrical contractors. The Forum will conclude just in time for the NECA Green Energy Challenge, the annual NECA Student Chapter design competition full of innovative energy solutions for existing buildings. Marc Spitzer, Commission to the Federal Energy Regulatory Commission (FERC), will speak at the upcoming 2011 Energy Forum in San Diego, Oct. 22. Spitzer replaces FERC Chairman Jon Wellinghoff, who was unable to attend due to an overseas meeting. He joins Allen Breeze, Senior Vice President for Schneider Electric – Power Business USA, as a keynote speaker for the event. The NECA Energy Forum is the only event that specifically addresses the numerous opportunities available for electrical contractors and their customers in renewable power technology and integrated, energy-efficient building systems. Commissioner Spitzer will focus on how FERC is working to ensure America’s ratepayers have safe, economic, and reliable supplies of electricity and natural gas; and transparent, robust and competitive wholesale energy markets. Spitzer was nominated as a FERC Commissioner by President George W. Bush. Prior to joining FERC, Spitzer was elected to the Arizona Corporation Commission (ACC) in 2000 and in 2002 was elected Chairman by his colleagues. He received recognition for his leadership of the Arizona Commission from 2003-2005. At ACC, Spitzer worked on policies encouraging expansion of natural gas infrastructure, specifically distribution and storage; creating a demand side management policy; enhancing the ACC’s renewable energy standard; and advancing consumer privacy concerns in telecommunications. At the FERC, Commissioner Spitzer is building on his record in Arizona on environmental issues. Demand response, energy efficiency, and access to the grid by alternative resources were major focuses of Spitzer in retail rate cases and policy decisions before the Arizona Commission. In 1992, Spitzer was elected to the Arizona State Senate for District 18. There, he served in the Legislature as Chair of the Judiciary and Finance Committees and was elected by his peers to the position of Senate Majority Leader in 1996. An attorney since 1982, Spitzer represented taxpayers in proceedings involving the Internal Revenue Service. After graduation from Dickinson College in Carlisle, Pennsylvania, he attended the University of Michigan, School of Law. Online registration is still open for the NECA 2011 Energy Forum; learn more and register here. When he’s not busy with his duties as NECA District 9 Vice President and Chairman of NECA’s Energy Solutions Task Force, Stan Lazarian is running his company, Electric Service & Supply Co., in Pasadena, CA. ESSCO was founded in 1949 by Stan’s father, Steve Lazarian, who had served as an electricians mate in the Navy during WWII. Throughout its history, ESSCO has performed a variety of construction projects including commercial, industrial and design build. A large percentage of ESSCO’s work has been public works contracting and public buildings. But Lazarian is also looking towards the future of electrical contracting – and he sees energy efficiency and alternative energy moving from the industry’s fringes to its center. “We don’t want to lose what could be the largest game-changing trend to hit our industry in the past two decades. Right now, there is tremendous momentum and incentives for sustainable construction,” he said. Lazarian and members of the Energy Solutions Task Force proposed a one-day event to introduce NECA contractors to the opportunities available in this growing market. The result is the NECA 2011 Energy Forum. >> Learn more about the NECA 2011 Energy Forum and register now!